The sale of buffalo meat helps restore buffalo to its prominent role as a nutritious food. It is much leaner than beef and has higher nutritional value. As we know, there was a time when people of the Great Plains centered their lives around the buffalo, using the animal for food, clothing, tools, and musical instruments. The following recipes are adapted for modern materials and methods. If you cannot find the meat in your local grocery store, order from a specialty store. 1. Cook the ground bison and onion in a skillet on low heat until the meat is browned and the onion is tender, about 10 minutes. 2. Add the beans, tomatoes, water, and seasonings. 3. Cover and simmer on low heat for 1 hour, adding more water if chili becomes too thick. ** Makes about seven 1-cup servings. and salt in a medium-sized bowl. Blend well. 2. Make a well in the center of the dry ingredients. 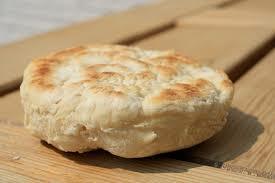 Gradually add water, mixing well to make a soft dough. If dough is too moist, add more flour. If too dry, add more water. 3. Knead in the bowl about 10-15 times, unil dough no longer sticks to your hands. Spray a 13x8-inch baking an with vegetable oil spray. Press dough onto baking pan. Bake 45-50 minutes. 4. Slice. Serve hot or cold. This bread is characteristically heavy and dense. Makes 16 2x3-inch rectangular servings. 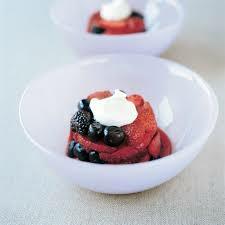 The following Berry Pudding can be served with it. 1. Crush berries. In a medium saucepan, combine berries with 1¼ cups water. Bring to a boil, stirring occasionally. Lower heat. 2, Add sugar or sugar substitute (Sugar substitutes made with aspartame are not stable). 3. Cook over low heat for about 4 minutes to thicken, stirring constantly, until consistency is of a very thick sauce. Serve hot. Make eight ½ c. servings.